It’s time to take a step back from your desk and the fluorescent office lights and head outdoors. As the weather gets warmer, it’s natural to want to spend more of your day outside. Wondering how you can do that while still getting your work done? We’ve done the research to help you soak up the sun without neglecting your productivity. First and foremost, let’s take care of the basics. If you’re using any kind of technology, you’re going to need a connection to Wi-Fi, which can be tricky if you’re heading out of your office’s or house’s signal range. Luckily, there’s a product that will do the trick. You can take your Wi-Fi just about anywhere with a personal hotspot device. This is a great alternative to unreliable and possibly unsafe public Wi-Fi sources. The device is password protected and can be used by multiple of your devices. Plus, it’s about the size of your smartphone making it easily portable! It’s no surprise you probably need your smartphone or laptop to do most of your work. But, it’s hard to utilize any of your tech gadgets outside because of the sun’s glare on the screen. This is largely due to the LED lights in the screen. The backlighting that LED lights produce are too dim compared to the sun’s rays. To combat this, consider getting a matte screen protector. Matte screens reduce glare and are ideal for outside use. They are available for both laptops and smartphones. Another option to reduce glare on your screen it to physically create shade over your laptop screen. You can opt to use a laptop add-on to block the sunlight from your screen. Sounds goofy, right? There’s actually a wide range of sizes and options for this exact purpose. From a small foldable attachment to a tall “tent,” it’s easy to find a style that fits your needs and comfort zone. Added bonus- Covering the sides of your laptop screens is an ideal way to increase your privacy, especially if you’re choosing to work in a busy and crowded area this summer! Perhaps the least expensive advice for working outside is to invert the colors on your laptop or smartphone through your settings. Inverting colors simply means that the colors “flip” making the background darker and the words lighter. Thus, it will be easier to read and will reduce the strain on your eyes. There’s really no reason you shouldn’t try this option; it’s a simple and quick trick. Plus, it’s said to help extend your device’s battery life which will allow you to stay productive for longer! 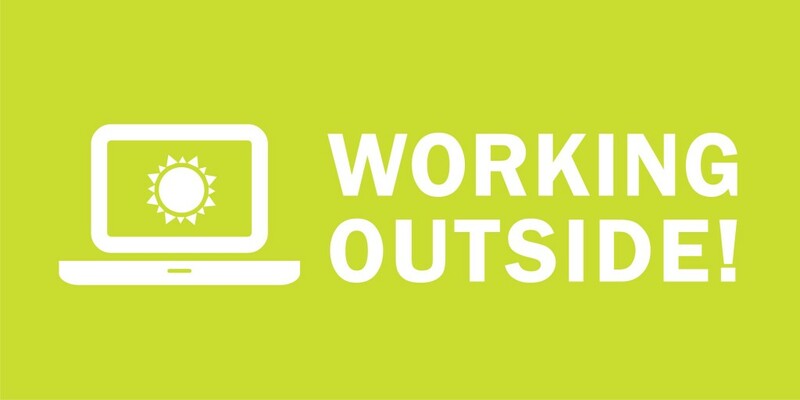 Now that you know how to work outside, it’s important to know why you should! Working outside has tons of work-related benefits including stress relief, increased creativity, and improved focus. Take advantage of the sunny weekends and evenings this summer with the help of these tips and tricks. With enough fresh air and time in the sun, we’re sure you’ll start to see positive changes to your work-life and productivity! And, if you’re looking for a way to put your newfound productivity to use, KellyMitchell is hiring. Take a look here!